I’m staring at this blank screen in consternation. I obviously can’t go down to my car and grab the new Stephen King book I got on Tuesday, because then I’ll do an even worse job with this review than I’m already fated to. I would normally read my next comic (even though it’s Team America, ugh), but somehow I forgot to get the 1983 issues of that registered in Comicrack, so now they’re sitting at home waiting for me to get there and sync, before I can proceed with this (at least there are only five Team Americas left) next book that fate and the CMRO has decreed I be subjected to. And anyway, I only justifiably could have read one comic anyway, so it’s not like I would have bought myself very much time. Here’s the thing. 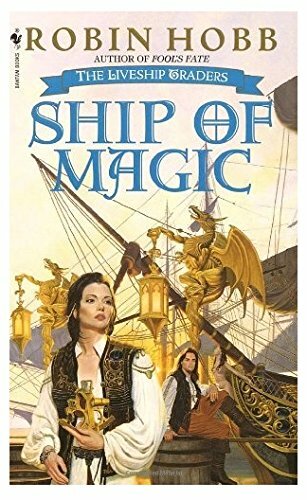 I sincerely don’t know whether I liked Ship of Magic or not. For instance, I absolutely care about what happens to these people. I am interested in the puzzles that have been laid out. (What’s the deal with wizardwood in specific and the Rain Wilds in general? What’s really going on with the serpents? Other things that would be spoilers to point out are open questions.) I’m interested in the world building around the slavery cultures that were halfway around the world from the events of the previous series, and the plot developments arising from that world building. So of course I liked the book, right? Look at all that delicious literature on my plate! And two books to go! But… I’m not sure I’ve ever taken this long to read a book that I actually finished. Or felt this much existential dread while reading this or that chapter. Or taken comfort in such objectively bad outcomes, because at least they were incrementally better than what I had been reading five pages earlier. I just… and there are two more books to go. I’ll say this much. I’m glad there’s a Stephen King book in my car downstairs, instead of the next book of this series as there probably would have been without the accidental timing of release schedules. It will give me time to sit in my room and think about what I’ve done. Okay, technically no longer entirely blank once I started narrating, but come on. Which mysteriously started syncing with my Chromebook again, hooray!!! Almost worth losing most of the functionality as a game-playing device. This entry was posted in Words and tagged fantasy, The Liveship Traders on May 25, 2018 by Chris.